Yesterday I went to see Dr. McDreamy or more professionally known as Dr. K. He's the foot and ankle specialist I saw nearly 4 years ago to treat a nagging ankle injury. This fall I started to have a "twinge" in my right ankle.....stiff ankle in the mornings, tender Achilles tendon, generally uncomfortable. D had me back off on some of the exercises that put undue stress on my ankle (anything that included running or jumping), added additional stretches and strength exercises for my calves, and I upped my yoga sessions. Backing off running was frustrating, but considering the last time I had ankle issues it resulted in surgery, no bueno. Fast forward to December. Ankle was feeling good, running started back up again and it felt great. My legs were strong, I was able to run without feeling like I was dying. And I was on my way to start training for my first race. And then came January. Slow, the pain in my ankle started coming back. 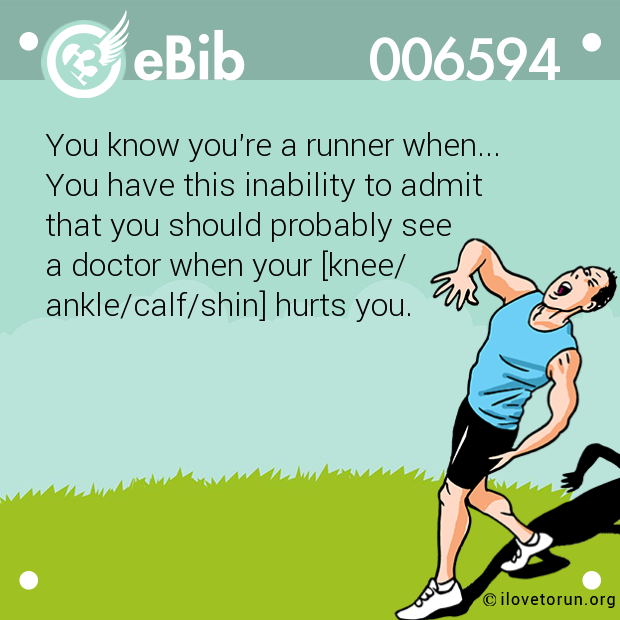 At first, it felt like my calf wasn't reaping the benefits from a good stretch, then it started bothering me while running and when it was still sore just after a normal day at work I started to worry. So it was off to see McDreamy......errr......Dr. K. I went! One of the reasons I like Dr. K. so much is that he too is a runner. He's had experience with ache and pains and working through injuries. But because he's a runner, he's never passed judgement when I've called myself one, too. He was the third doctor I saw for my first ankle injury but the first to tell me I had options, none of which were to simply "lose weight". Because of that, I totally bypassed seeing my regular PCP and went to see him again. After a Q & A about when the pain started, what I had been doing vs. what I am doing, speed, treadmill incline, shoe type and a little poking around, he believes because of a "tight heel cord", I have a case of tendonitis. Which is BRILLIANT. Not that anyone wants to be injured and have tendonitis but, I can deal with tendonitis. And because I didn't wait long (like last time) to get it treated, he's pretty sure I'll be good to go in a few weeks. AND I don't have to stop running. Now, that doesn't mean I get to just jump back on the treadmill and bust out all the miles tomorrow. He gave me a lift to try in the heel of my running shoe. I need to keep the incline below 1%. I have a steroid pack to take to help bring down the inflammation, and need to work in more walking intervals while things heal up. Did I mention he thinks this is because I tried to increase my mileage too quickly? Riiiiiight. Me, over do it? I'm stunned someone would even suggest it. But yes. Thinking I use the C25k program to get myself back on track. The 10k I am hoping to run isn't until the end of May so I have time to get my mileage where it needs to be by then. I go back to see him next week for the results of the x-rays to make sure there isn't anything worse going on, but I'm taking his lead in thinking there isn't. Until then, I'm just happy that I can still get my runs in without freaking out that I'm doing more damage. Now, if I could just kick this head cold, we'd really be in business!